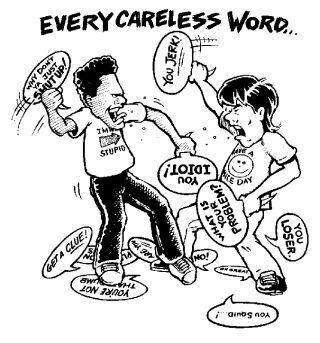 On the day of judgment people will give account for every careless word they speak. In this day and age, people around the world have probably the greatest ability and opportunity to communicate to others than ever before. Think about it. With our current technology, we can digitally communicate our thoughts to people we do not even know, via a myriad of electronic devices. All this is possible via the Internet, the World Wide Web (www) of mankind. “Oh what a tangled web we weave if at first we seek to deceive!" I heard that old saying long before the world wide web of communication came into being, but oh how true and applicable it is today! Especially when we consider that more people than ever before believe they can say anything and everything about whoever and/or whatever they feel like with impunity. But is that wise? Many proverbs emphasize the importance of sound speech and that silence is better than unhealthy speech (e.g., Proverbs 10:11; Proverbs 15:4; Proverbs 17:27-28). SOURCE: The IVP Bible Background Commentary – New Testament. Also note that Christ seemingly allows no quarter to those who consider themselves covered by his atoning sacrifice on the cross. So what’s the solution? Seems to me there is only one solution. It is the solution that Jesus offered time and again during his time here on earth – and the same solution he continues to offer today –“Abide in me and I in you.” (John 15:4) As long as I sincerely and diligently seek to abide in him, there is little room for little else.